Armchair; made from oak and upholstered in pale blue velvet dralon and edged with pale blue silk braid. The arms are padded with scrolled ends. The seat back has fourteen self-fabric buttons. The chair has turned legs with metal feet. 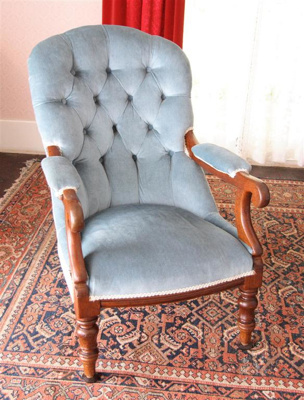 This armchair once belonged to Sir Harry Atkinson, the builder and first inhabitant of Hurworth Cottage.